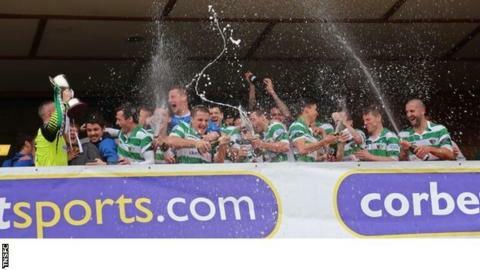 Champagne corks were being popped in Oswestry last Saturday as The New Saints celebrated their record-breaking eighth Welsh Premier League title. But, for TNS captain Paul Harrison, the part played by the former Liverpool reserve keeper in the Saints' third successive title was an emotional experience. Harrison, 29, was a four-year-old boy when he lost his father Gary and uncle Stephen in the Hillsborough disaster, on 15 April 1989. And it was to his keeper that TNS manager Craig Harrison turned following Saturday's 1-1 draw with Airbus UK - the game that clinched another league crown, and overtook Barry Town's record of seven league titles. They are no relation - former Middlesbrough player Craig is from Gateshead, while Paul was born in bred on Merseyside. But, as a fellow member of the wider footballing community's brethren, the TNS manager was able to empathise. "It was very emotional for him," the TNS boss told BBC Radio Shropshire. "Paul's had a tough time with the Hillsborough inquest. But he's a fantastic lad. A really genuine guy, a super individual who's applied himself in an impeccable manner as a true captain and a man. "He's played every game as our number one keeper for the past six seasons. And there just aren't enough superlatives to say about him. "There will be people that will be proud of him." TNS only needed a point against second-placed Airbus at Park Hall to secure their eighth title in what has been an astonishing 14 years for the former village club from sleepy Llansantffraid, five miles south of Oswestry. Admittedly, TNS were were pegged back by a late Tom Field penalty to slightly dampen the mood - earning Airbus their fourth 1-1 draw with the Saints this term. 1997-1998 -Total Network Solutions Ltd invest £250,000 over a five-year period in Welsh border village side Llansantffraid. The club change their name to Total Network Solutions FC. 2000 - Total Network Solutions are crowned Welsh Champions. 2003 - Merge with Oswestry Town. 2004-2005 - League/Welsh Cup double. 2005-06 - League/Welsh League Cup double. 2006-2007 - Change name to The New Saints. 2007 - Ken McKenna guides the Saints to another League title. 2010 - Mike Davies earns their fifth league title. 30 Dec 2011 - Craig Harrison takes over as manager. 2012 - Harrison achieves League and Welsh Cup double after just four months in charge. 2014 - Secure their eighth league title. But, playing their final home game of the season, Harrison's men still managed to go the whole campaign undefeated at Park Hall. And they were able to crack open the bubbly thanks to another strike from their top scorer Mike Wilde, in his second spell with the Saints, who followed up his 25-goal Golden Boot-winning haul in 2012-13 to hit another 15 so far in the current campaign. "Mike Wilde's been such a consistent scorer," said Harrison, who was enjoying his own third straight title triumph since replacing Mike Davies in January 2012. "I tried him to bring him in on loan from Chester in the January when I first came in. "He told me that he was going to stay at Chester and then, when we did finally get him to come here, there was always going to be pressure on him. You know the old saying: 'Never go back'. "But he was top scorer last season and this. He's been top drawer." But the most exciting date ringed on their calendar is the UEFA Champions League draw, which is set to take place in Nyon, Switzerland on 23 June. "Now the Champions League beckons again," said Harrison. "It's a tight turnaround, just a few weeks at the end of the season. I'll probably only get a couple of days' holiday, that's the reality of it. "But it's brilliant what we've done. It's still a big achievement. And I'm immensely proud of the players and everyone at the club. "Airbus have pushed us all the way but I think, over the 34 games, we've been the best team."